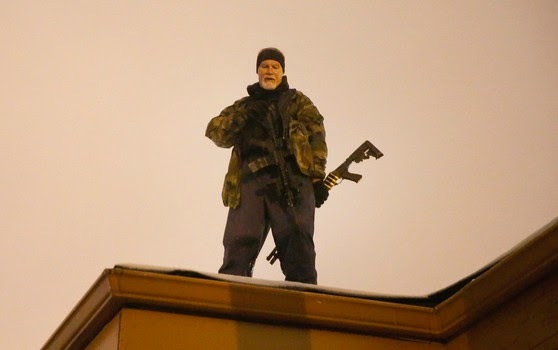 Armed Oath Keepers have advised St. Louis County Police through their attorney that they have every right to guard rooftops of Ferguson businesses that want them there, and have refused to stand down. Members of Oath Keepers, a national group that includes current and retired military and law enforcement personnel, have rejected orders from St. Louis County Police to abandon posts on top of private businesses that invited their protection, the St. Louis Post-Dispatch reported Monday. The order to stand down was issued under presumed authority of a county ordinance prohibiting unlicensed security personnel. The committed presence of Oath Keepers could renew confrontation dangers, as group founder Stewart Rhodes had earlier cited a report of members being targeted, presumably by a federal law enforcement sniper team. Per Rhodes, such teams had not communicated with local law enforcement, let alone coordinated activities with them. Confirming the Post-Dispatch report is an update from Rhodes sent to members and supporters Wednesday, explaining that, contrary to some reports, the group did not abandon their posts. The alert also included a letter from an Oath Keepers attorney. What will happen next, and if the official response will be through attorneys or through initiation of force aimed at removing volunteers from businesses they have been gratefully welcomed to protect, is unknown at this writing. The one certainty at this time is that no businesses being guarded by armed guest volunteers actualizing the motto "Not on our watch" have been attacked or burned while they were standing guard.